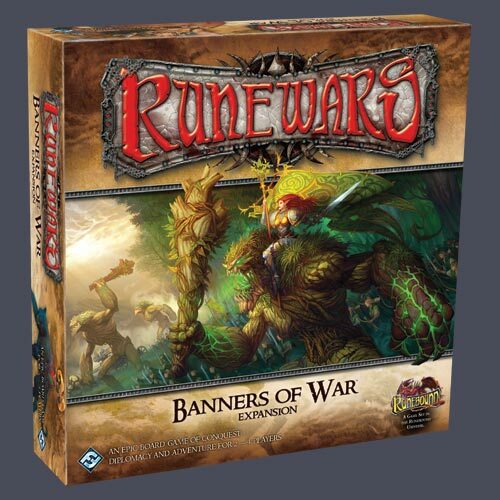 Return to the war-torn lands of Terrinoth with Banners of War, an exciting expansion for Runewars! With 8 new unit types â€“ 2 for each faction â€“ you can customize your armies like never before. New Development cards let you upgrade your existing units and purchase new faction-specific abilities, while the Commanders of the Battlefield variant lets your most valiant heroes lead your forces to victory. Featuring new Hero, Objective, Season, Reward, and Order cards, plus over 50 new plastic figures, Banners of War lets you raise the stakes in Runewars and become the ruler of Terrinoth! Other products in the "runewars" series.